I want to share this amazing polish that I ordered from an Australian company called Picture Polish: Ozotic Pro Elytra 528. Gorgeous, huh? I received so many compliments on this polish. Bonus: my manicure last 7 days while i was in SoCal for the Long Beach International Dragon Boat Festival (eek, salt water + harsh conditions) plus a day of indoor rock climbing. I love it when a mani endures my frequent handwashing and hard workouts. I promise to get more photos of this next time to show how amazing this polish was, especially layered over a glossy black polish such as Zoya Raven. The formula of Ozotic Pro Elytra 528 is a bit on the runny side but still manageable. Since the base color is clear, I layered the multichromatic glitter over a black creme base though I will have fun experimenting with layering combinations. I think Elytra 528 will look great over a creme base with similar tones as the glitter (blue, green, turquoise, purple, red). 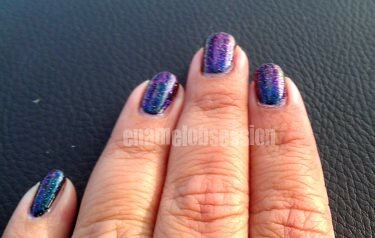 I think 2-3 coats for a more even glitter finish would be nice as well. Labels: "ozotic" "zoya" "glitter" "multichromatic glitter"
Some deliciously holographic goodies I purchased from Llarowe recently: Love. All original photos on this blog are by Manda Wong for enamelobsession.com. Picture Window theme. Theme images by Jason Morrow. Powered by Blogger.